Yes, I do like chicken because there are so many ways to cook it and the result can be so different. Probably I buy more chicken than other meats (price and endless possibilities). 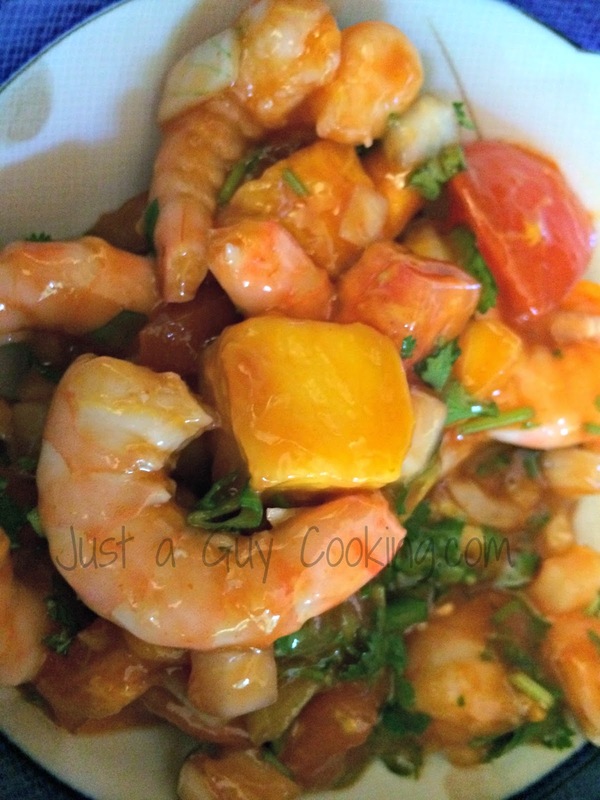 This dish is one of my favorites because is soooooo tasty and not that hard to make. At dinner time, just put the chicken in the center of the table, add some fresh bread (sometimes I even have time to bake one...) and a nice glass of wine. Some people swear that the perfect wine for chicken is rose.... ouch. If you are one of those, please close this page and go to Martha Stewart's recipe site...or Oprah's... or your favorite hipster cooking site. The ones who read this blog only believe that there are two kinds of wine: red and white. 1. In a Dutch oven over medium heat fry the two pieces of bacon until near smoking. If you don't have a Dutch oven you can use an oven pan (large)...and if you don't have an oven pan...change recipe. 2. Preheat the oven at 375 ˚F. 3. While the bacon is frying, season the chicken breasts with the rosemary and salt, both sides. 4. Place chicken skin down into the hot pan and let it brown a little. 5. Halve the lemon and place the two halves beside the chicken in the pan, flesh down. 6. Turn the chicken once to brown a little the other side and then turn it so the skin side is facing up. 7. Place in the oven and let it cook for about 45 minutes to an hour (check the meat temperature with a thermometer). 8. Place the carrots in big pieces in a deep pan with enough water to cover. 9. Bring it to a boil and then add the butter and the tarragon. 10. Let simmer until carrots are fork tender and water has reduced to 3/4 approx. 11. After 1o minutes add the quartered potatoes and keep simmering. 12. When the potatoes are semi-soft (we don’t want them too soft!) add the cream, and, if necessary, season a bit more. Simmer until reduced to a creamy texture. 13. Bring the berries, sugar, lemon juice and zest and vinegar to a boil in a sauce pan with one cup of water. 14. Simmer until sugar dissolves and berries become soft, breaking their skins. I usually add a bit of red wine to give it a kick, but this is optional. 15. When the sauce is a bit thick, then is ready. 16. By now the chicken should be ready, so, I recommend to bring the chicken to the table, dutch oven and all (just remember that the Dutch oven is really hot, so use oven mittens, otherwise you will end in the hospital eating God knows what -been there done that-), and in two other serving plates bring the creamy veggies and the berry sauce. 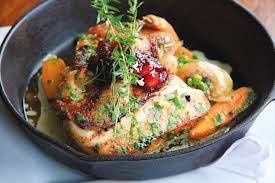 Amazing dish! ** The photo is not mine... it's Emily Harri's. Every time I cook this dish, by the time I remember that I need a picture... it's too late...gone. I will update next time I cook this dish. So, it has been 20 days since I planted the first seeds in my herb garden (Clic and Grow)... this is what I have now: fully edible herbs. They are ready, sturdy and quite tasty. Quite impressive if you ask me. I had no intervention whatsoever with the herbs. All I did once was to refill the water (when needs water the light flashes with the S.O.S. code... quite humorous). Meanwhile I am growing the old fashion way other herbs... I planted them a week prior. They look fragile, skinny and not ready at all. I do like this product. The test of time will tell if the product is worthwhile. So far so good. PS... the basil looks tinny because I used some last night, so I cut what I needed and it should be back to regular size in a week or so. The people that knows me are quite aware that I really like my tequila. I have been drinking tequila since I was in age of doing so legally (you have to believe me, what else can you do?). Way back then tequila was a poor man drink but somehow I liked it. I remember clearly going Fridays night with my friends -yes...back then I had friends- and everybody would ask, most likely for a Cuba Libre (Rum with Coke) but I always asked for tequila. My friends always thought that I was just being eccentric and the waiters though that I was cheap. I was neither. I just liked tequila. 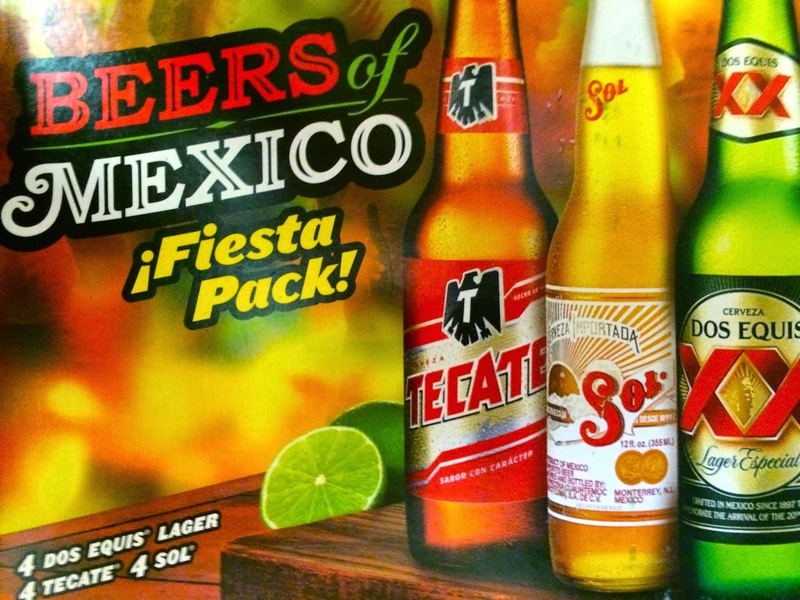 What was poor man drink 40 years ago...now is a fashionable drink and, if you have the money, then you can easily pay hundreds of dollars for a tequila shot. Hundreds! I don't though, I drink good tequila and sometimes what I drink is a bit expensive and some other times it is not. I just finished a tequila given to me by my mother in law (my biggest supplier) during my last trip to Mexico. 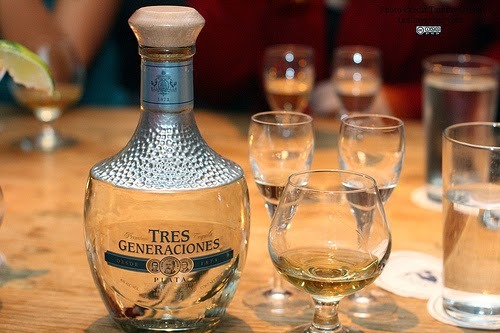 It was a Tres Generaciones Reposado. I opened the bottle yesterday and today is gone (just Kidding!!). This was a good tequila. I would say a great tequila. This particular tequila has been distilled three times (the norm for a Reposado is two) and it has been aged for at least 4 months in oak barrels. It is soft, nice to the palate. I did really enjoyed quite a bit. The flavor is defentely agave with a tone of oak and pepper...I would say a bit sweet. definitely doesn't have the kick that other tequilas have. As I drink it only straight, I appreciate the silky and smooth experience. If I were to give stars I would give Tres Generaciones a 7 stars out of 10. When the sun decides to stay with us for a while, like in Spring and Summer, the first dish I want to cook is Cebiche. One of my favorite Cebiche is the one with one of my favorite fruits: mango. 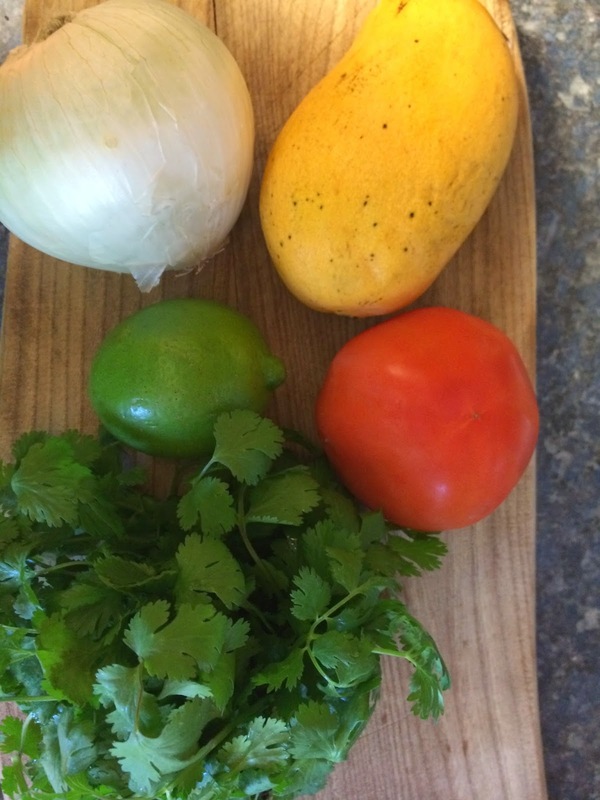 The contrast of sweetness from the mango and the salsa is just delicious. When is time to buy prawns... I cook Cebiche. Also I do a raw Spotted Prawn Cebiche that is out of this world. I don't eat spicy food so I don't add any Serrano peppers, but most people do... feel free to have your muy macho moment and go crazy. You can always ask for the day off next day. Cebiche's loyal companion are saltine crackers. You really can't have Cebiche and not have saline crackers. It just works like a charm. 1. Put half a cup of ice (or more) in a medium bowl and add cold water. Reserve. 3. Wash thoroughly the prawns but don’t peel the skin just yet. Once clean put them into the boiling water and let them cook for 4 minutes -no more!-, then remove them immediately, discard the warm water and put the prawns into the iced water to cool them. Leave them there for now. 4. Cut the mangoes in small cubes (about 1/2”) and reserve. 7. 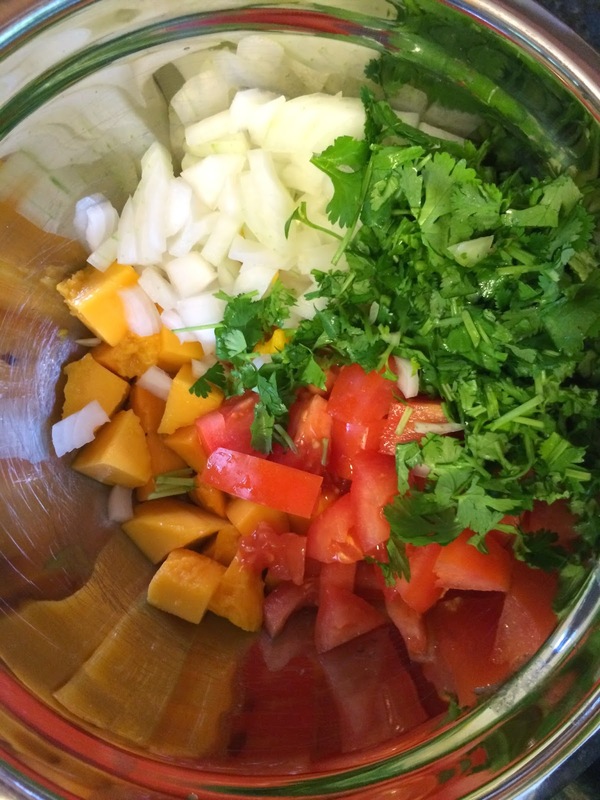 Chop finely the cilantro and reserve. 8. OPTIONAL (I don’t do it) Chop the Serrano pepper and reserve. 9. In a separate bowl mix the ketchup with the lime juice until incorporated. Reserve. My friend Pat (like in Pat in the hat) has a husband. Go figure. Nevertheless he was not excited about the Chocolate-bakon cookies I posted before. He just doesn't get the whole salty/sweet experience. To honor my friend's husband wishes today I am sharing the Mother of all chocolate/walnut cookies. I baked these last week on Monday. By Thursday they were all gone... I blame the wife because the cats are unable to lift the glass lid. I have said it before: you can go through life just surviving or you can live your life to the full extent. I go for the last, so I don't feel guilty when I eat them (and they are really irresistible). One is going to die anyways...why not go with the chocolate flavor in your mouth?. 3. In a big bowl we mix the butter with the sugar (I use a mixer…but if you want to build muscle…then doit by hand) until you get a smooth light yellow paste. 4. Add the beaten egg and continue mixing. 5. Add the melted chocolate, the vanilla, the salt and the milk and continue mixing until well incorporated. 6. Add the confectioner’s sugar and baking powder and mix until incorporated. By now the dough is kind of a paste…don’t worry, that is what we are looking for. 7. Now, fold (by hand…sorry) the 250 grams (!!!) of chocolate and the chopped walnuts and fold again. It looks like a lot of chocolate, but hey, there is only one life to live. 8. Cover with parchment paper a baking sheet and use a tablespoon to drop the dough in the baking sheet. The tablespoon needs to be a bit overflown. We can fit 12 cookies per sheet, so we’ll repeat this step twice to get the 24 cookies. 9. We put them in the oven and bake for 8 to 10 minutes (10 is the max!). The cookies will look a bit soft but will harden as soon as they cool down. 10. Once removed from the oven, we let the cookies sit for 10 minutes on the baking sheet and then we move them to a cooling rack. 11. We repeat the process to do the second batch. I know... I have this thing with chocolate. I baked last week the most decadent chocolate cake. It was fantastic...but with tons of chocolate (actually the chocolate cake with more chocolate in it that I have ever baked)...and a Grand Marnier 1/2" thick frosting. Thanks God my wife loves to eat.. in less than a week is gone. With that as our decadent past, full of calories...but one has to die of something, right? today I decided to bake some Peanut Butter Chocolate Cupcakes. No frosting because my wife then can't take them as lunch to work. 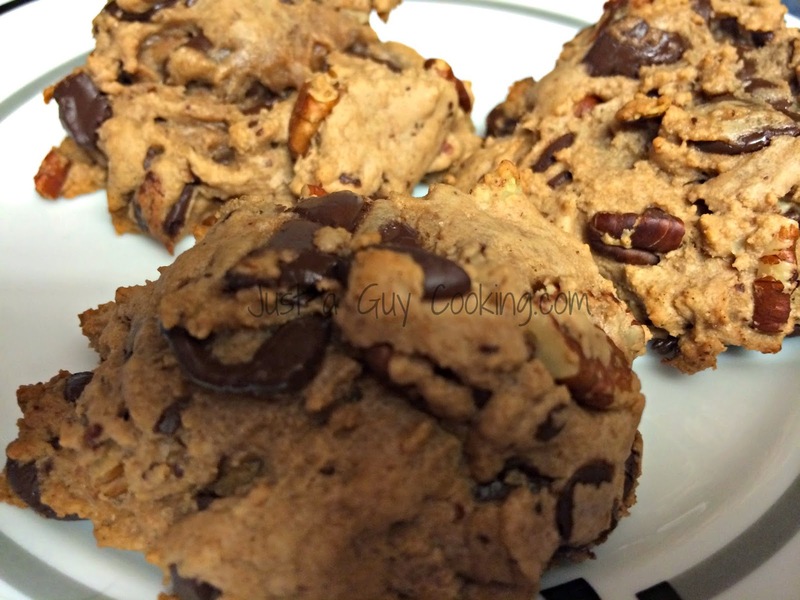 I also did some Chocolate-nutt cookies (posted in my other blog -Spanish- here ). Eventually I will post it here...but not today. Today we are baking some cupcakes! If you are faint of heart...don't even try them. 2. Beat butter until soft and blend with one cup of brown sugar until incorporated and soft. 8. 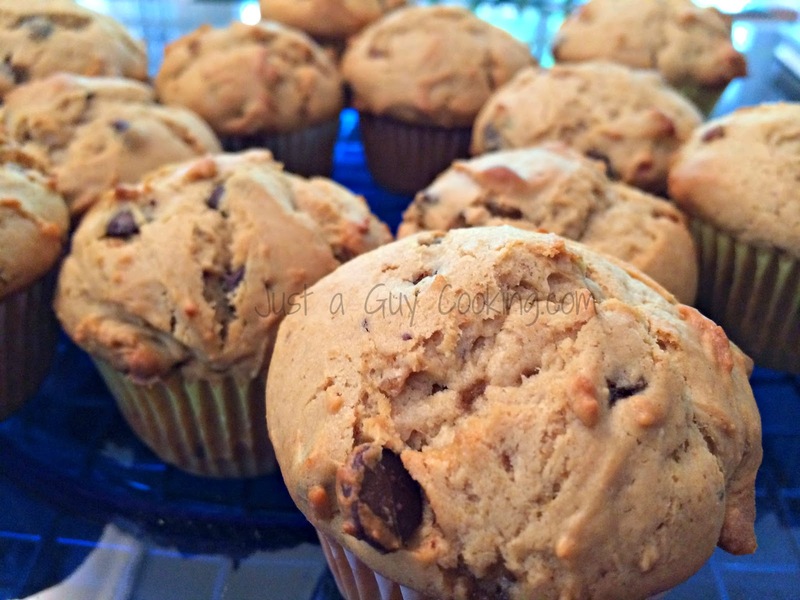 Pour into a lined 12 cup muffin pan. Yes, I know that I am not Jaime Oliver who has these amazing gardens where he collects his herbs to cook. Also I don't have somebody to clean after me, but that's another story. There is no doubt that cooking with fresh hers makes a HUGHE difference in flavor and texture, but most of the time we use dried oregano, dill, etc. That is when my new toy comes to hand. I discovered in Kickstarter a project that was going to design a "minimum care" kind of herb garden. I jumped on board. After a while, like most Kickstarters are, I got mine...last week. You open the box and there is nothing to assemble or put together (if it was Apple's it would be called The Igarden. Pretty much you find a spot in your kitchen, preferably near a window, and plug the thing. You add water. Once plugged to your outlet, automatically sets a on-off schedule and, when low in water it will start flashing with an S.O.S signal. That's it. I plugged mine last week and chose tomatoes, salad rocket and chilli. I still have another 3 cartridges for next time. In two days I could see the plants coming out. Incredible. Now they are about 1 cm. tall with leaves and all... I am happy. 2. In a large skillet, melt the butter and stir in lemon juice, bread crumbs, peanuts and, at the end the garlic. Stir frequently until peanuts and crumbs are golden. I use a salted nut mix: walnuts, pecans, peanuts, almonds, etc. 4. Clean the salmon fillets (I use Coho Salmon or Spring Salmon) and lightly salt them. Coat each fillet with the bread crumb-peanut mixture until you get a thick layer. 5. Place the salmon fillets in the baking dish and add the rest of the bread crumb mix on top of the salmon, evenly distributed. In a sauce pan, mix the heavy cream and the yogurt in low heat. Once incorporated, add the lemon grass, the lemon juice and the basil and keep stirring. Add the corn starch little by little (to avoid lumps) and stir with passion. If you see any lumps, dissolve them. Stir until thickens and, at the last minute, add the vodka. Reserve. 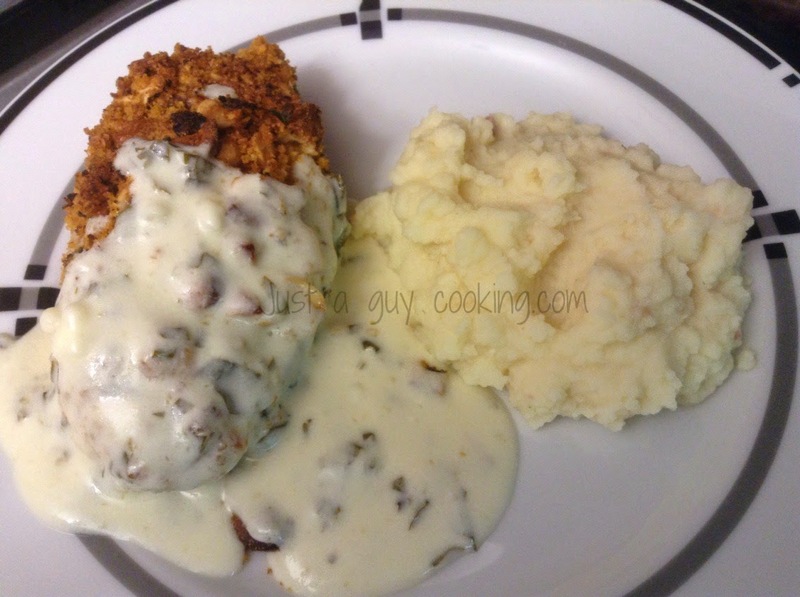 I love this recipe and you can change the fish for others like halibut -which I did yesterday-. I usually eat it with a nice red wine, some fresh baked bread and a nice home grown chard and beet leaf salad with a tequila lime vinaigrette. It is absolutely amazing and delicate.